The title of our novel Stumbling Stone is a reference to the memorial plaques placed in Germany and other countries to commemorate the victims of the Nazis. 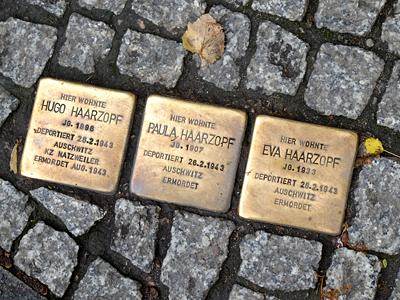 Our website designer Nick Despota recently returned from visiting Berlin and took this photograph of three stumbling stones – Stolpersteine – that he encountered at Schönhauser Allee 41. Doing a little research, I learned more about Hugo Haarzopf, his wife Paula, and their 9 year old daughter Eva. They were deported to Auschwitz in 1943 where Eva and Paula were apparently immediately gassed. Hugo was killed later at a different camp as part of a scientific experiment. Some members of Hugo’s family had already emigrated to Argentina but he believed because he was a decorated World War I veteran, he wouldn’t be harmed. He and his family, including his widowed mother, operated a candy import business until 1938. When it was forced to close, they started manufacturing bathrobes in their home. By the time Hugo began asking about rental rates in Buenos Aires, it was too late for the family to leave. Eventually almost the whole family – mother, sister, wife, child – was murdered – ermordet – by the Nazis. These stumbling stones for the Haarzopfs and other Holocaust victims and the websites that tell their stories are compelling. We hope our novel gives voice to another forgotten victim of the Nazis: Rudi’s Uncle Gerhard Raab.